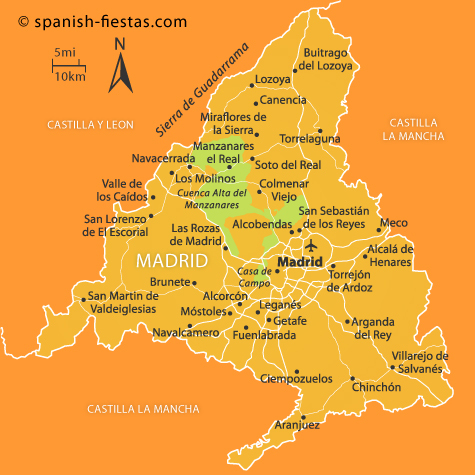 Madrid, the capital city of Spain, is also the capital of the province and autonomous region of the same name. La Comunidad de Madrid is bordered by Castilla y Léon and Castilla La Mancha. It is the most densely populated of all Spain’s provinces with over 6 million inhabitants; well over half of whom live in the capital’s metropolitan area. This also means that only the regions of Andalucía and Catalonia have larger overall populations. When the autonomous regions were initially established the proposal was to include Madrid in Castilla La Mancha but the opposition from the other proposed provinces in that region, who envisaged Madrid being able to dominate the decision making processes, led to a re-think and the establishment of the new region. The triangular shape represented by the boundaries of the Madrid community can be seen as natural geographical barriers with the Guadarrama Mountain range to the west and the fluvial river basins to the east. Most of the region is between 600 and 1,000m above sea level but some of the mountain peaks rise to above 2,000m … quizmasters have long enjoyed the fact that Madrid is Europe’s highest capital city! Madrid’s climate can be categorised as Continental Mediterranean, which means that is has very hot summers and cold, dry winters. The winter temperatures can frequently fall to freezing but, as the annual rainfall is generally less than 500 mm, there are plenty of crisp, cold and bright days in the winter. Snow is not unknown during the winter, indeed it is quite common in the mountain areas to the north but the city is seldom brought to a standstill by it. Although not a capital city until 1561, Madrid, then known as the Fortress of Mayrit, was developed around 870 AD in order to help protect Toledo. 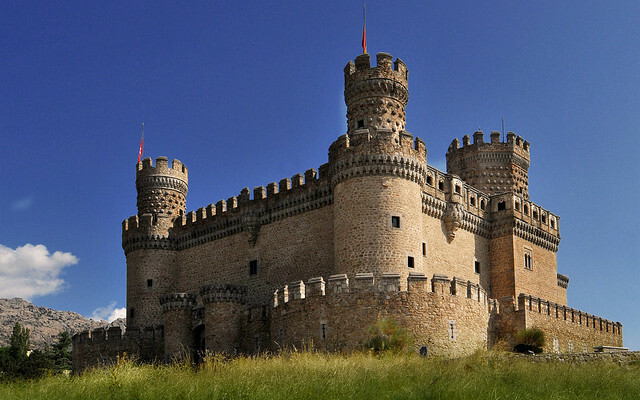 It remained a small city, although quite significant, but later became popular with the Castilian monarchs because of the quality of the hunting in the area. The Real de Aranjuez Palace and then the San Lorenzo de El Escorial were established and, after the foundation of the University of Alcalá de Henares the city became a cultural centre as well. Phillip II established Madrid as the capital, partly to distance himself from the religious powers in Toledo. It was not until the 18th century, though, that the city really began to establish itself as a ‘grand place’ – growing to over 150,000 people and establishing many of the buildings, monuments and institutions that remain today. Since the presentation of the first Spanish Grammar to Queen Isabella in 1492, Castilian Spanish has been seen as a useful power tool as well as a means of communication. The Queen, always politically astute, recognised that, with the development of the Spanish Empire, the corresponding globalisation of the language could have a significant impact. This certainly proved to be the case as is witnessed by the prevalence of Spanish as the language of so many South and Central American countries. When the Spanish Royal Academy was formed in 1713, its aim was to preserve the so-called ‘purity’ of the language and it set about producing its own authoritative dictionary (from 1726 to 1739) and grammar rules (in 1771). Spain remains very different from Britain with its attitude towards its language. New words are not included annually in the dictionary at an editor’s discretion but rather have to pass through a rigorous examination by the Academy before they are considered suitable. This means that some words in quite common usage will not be in the dictionary because the Academy has not thought them to be ‘appropriate’. Franco declared Spanish to be the only official language in the country but, with the advent of a multi-party democracy, Catalan, Basque and Galician have been given official recognition in various parts of the country. Economically the Madrid region remains the autonomous region with the highest per capita income in Spain and the recipient of about a third of all foreign investment in the country. Although the levels of industry here rank only fourth in Spain, it is in the high and medium technology areas and the service industries that Madrid comes to the fore. Research and development have also been substantial growth areas during the past decade. Products grown outside the city itself include potatoes, cereals, and fruit and vegetables in the south and east of the region whereas forestry is important to the north east. In mountainous areas, there remain granite, gypsum and lime quarries. The advent of short break holidays across Northern Europe has had a significant impact on the tourist and hotel sectors of Madrid, bringing in huge numbers of foreign visitors, especially during late winter and spring. EasyJet holidays offer great short break deals to Madrid from the UK. Madrid Barajas airport is among the ten busiest in the world. The airport is connected to the city by means of a rapid link in the Madrid Metro, one of the world’s most expansive and fastest-developing systems; only London has a larger network. The region is well served by Cercanías Madrid, the commuter rail service for the metropolitan area, and is, of course, the hub of the country’s RENFE network, serving the whole of the country. 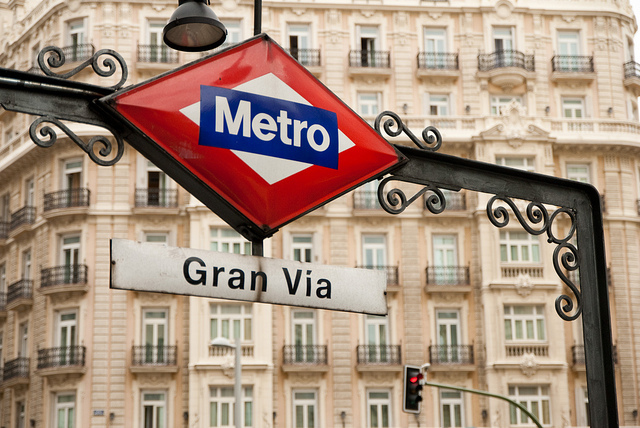 The main train stations are at Chamartín in the north of Madrid and Atocha in the south. The high-speed AVE trains now link Madrid with Barcelona, Malaga, Segovia, Seville, Tarragona, Toledo, Valladolid, Zaragoza and continues to expand. But the area around Madrid has much to offer visitors as well, and visitors who only visit the city centre are in danger of missing some fascinating insights into this part of Spain. For example, Alcalá de Henares is not only the site of one of Spain’s foremost universities but was also a base for literary legends such as Cervantes and Lope de Vega. This is a picturesque little town with not only Cervantes’ childhood home but many other impressive Renaissance buildings, some delightful outdoor spaces and a rather distinguished aspect about it. Aranjuez, 50 kms south of the capital, has three notable claims to fame – its Palacio Real, an 18th Century palace and gardens modelled on those at Versailles; its butterflies and its strawberries. 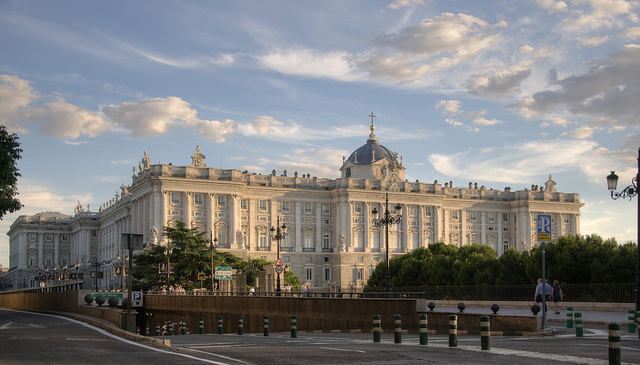 The Palace can offer some welcoming relief after the searing heat of Madrid, with the grounds as worthy of your time as the sumptuous interior. This part of Spain is such an important site for butterfly breeding that, when the motorway was constructed through the region, the planners had to avoid all the possible butterfly sites. The famous ‘fresones de Aranjuez’ have the reputation of being amongst the tastiest (and biggest) in the whole of the country and if you’re there at the right time of year I defy you to be able to walk past the street sellers offering them to you! 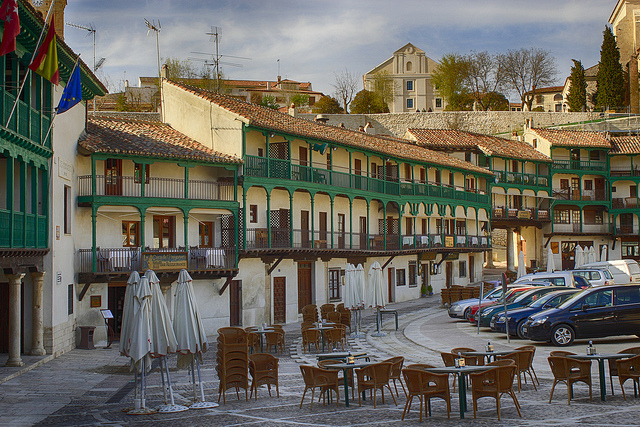 Other towns to stop in rather than drive through are the charming Chinchón, home of a particularly potent make of anis – and the mountain town of Manzanares el Real, with its totally stupendous Gothic castle. 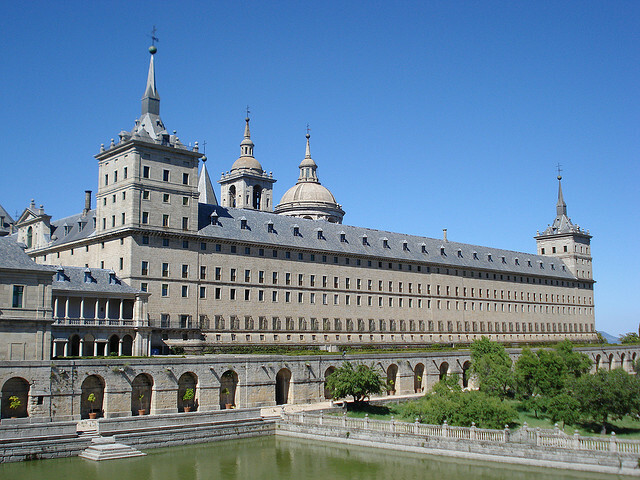 One of the most spectacular and thought-provoking things to do, though, is to make your way to San Lorenzo de El Escorial and then on to Valle de los Caídos. San Lorenzo itself is a small, elegant town but it is totally dominated by the enormous Monastery, built by Felipe II. To refer to the largest building in Spain simply as a monastery goes nowhere near to doing it justice; it is also a palace, a mausoleum, a library and a fantastically stocked art gallery. For me, this building is central Spain’s Alhambra. After celebrating the greatness that man can aspire to, the poignancy of then travelling just down the road to Franco’s ‘Valley of the Fallen’ becomes even more apparent. This enormous stone cross and appalling basilica, built right into the heart of the mountain by prisoners of war (many of whom died during the construction) is a shattering example of man’s inhumanity to man and a reminder of how far Spain has come since Franco’s death. Madrid has the cultural and educational attractions that one expects from a capital city. There are, additionally, many language classes, flamenco classes, wine tasting courses and a plethora of similar packages that allow people to pursue a new or previously acquired enthusiasm at the same time as enjoying life in Madrid. Outside of the city, Cercedilla, in the Sierra de Guadarrama, is a popular location for people wanting hiking holidays or cycling and mountain biking. There’s also some good rock climbing in the area. Although some locals ski in the Guadarrama, the snow is not really predictable enough or deep enough for visitors to rely on it. There are more than 20 golf courses in the Madrid area, although many of them have only 9 holes. If golfers do fancy a round whilst out on holiday, a reservation is more or less essential as the good courses are very busy and not always accessible. The 2nd May is one of the biggest celebrations for people in the area, commemorating resistance against the French in the War of the Spanish Succession – or the Peninsula War, as the British knew it. Generally, towns have concerts, dancing and bull fights. Just two weeks after, the San Isidro Festival begins, honouring the patron saint of the city. This is basically a one month long street party. Aranjuez has an annual festival of antique music during May and June which attracts considerable international attention. Since 1963, Easter Saturday has seen more than 250 inhabitants of Chinchón turn their town into Jerusalem for a day with a procession of the passion of Christ; an artistic and religious commemoration declared to be a festival of national tourist interest. Visitors to Madrid can try food from most countries of the world as well as every region of Spain. One could be forgiven, therefore, for not appreciating the regional specialities available. However, keep an eye open for Cocido Madrileño, a stew; callos a la Madrileña, tripe and beans; bacalao a la Madrileña, salted cod; potaje de garbanzos, thick chick pea soup; and torrijas, a bread pudding. Meat, especially beef, from the Guadarrama mountains is very popular. Not forgetting, of course, the strawberries from Aranjuez and the anis from Chinchón. Local wines have only been recognised as Denominación de Origen (DO) since 1990 and all of the vineyards are in the south of the region. Particularly well-known are fresh, white and fruity malvar wines from Arganda and some very intense garnacha reds from Navalcarnero. Thanks for some great suggestions for around Madrid We have visited the city and many of the central museums and art galleries but these suggestions would be good for our travels with our camper Looking forward to trying some of them next summer or autumn! Some great insights once again. Thank you. As a foreign tourist, it is so easy to focus some of the gems of Madrid cuidad then skip out into the other regions without properly exploring the Madrid region itself. We’ve added a some of your suggestions to our list of places to visit during our next trip to Spain in May/June 2019. For info, we’ve gained a greater understanding of modern art at El Museo Nacional Centro de Arte Reina Sofía than the many other great art galleries of Europe. It is a fantastic place – not to be missed.